This Target Achieved teacher stamp is pre-inked so it's always ready to use. 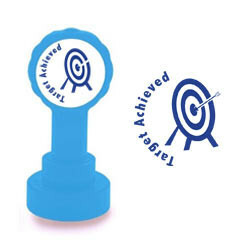 Perfect for a quick way of acknowledging effort or a goal reached. This handy classroom resource saves you time, while marking work in a fun way. Find out how to store and maximise the usage of your teacher stamper - TeacherTalk article.